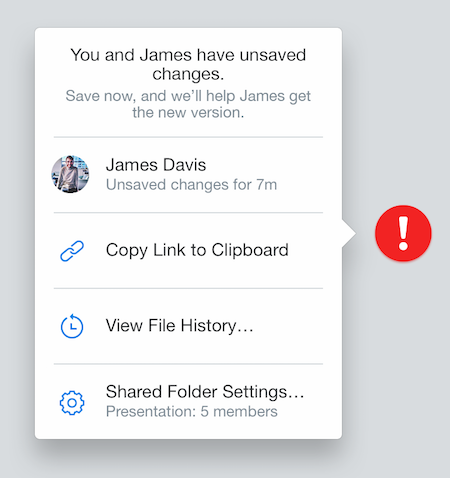 The Dropbox badge will alert you as people open, edit, and update shared file. This article describes all the alerts you'll see. Note: To use the Dropbox badge, your computer must have the Dropbox desktop app installed, and you must be connected to the Internet. Learn more reasons for why the Dropbox badge may not appear. 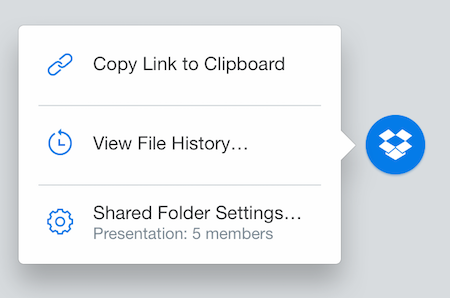 When you’re the only collaborator in a document, you’ll see the Dropbox badge that lets you know that you’re working right within Dropbox. You can click the badge to take quick actions like sharing a link and viewing previous versions. When another person opens the file you’re working on, you’ll see their initials in the Dropbox badge, or you may see a photo, if they’ve set a profile photo. 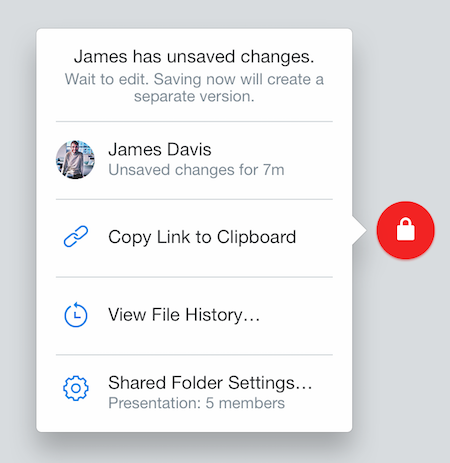 The Dropbox badge will let you know that others are editing the file by turning red and displaying a lock icon. You’ll still be able to edit, but the badge is there to warn you that if you and the other person continue editing at the same time, you may create different versions of the file. When you and another person are editing a file at the same time, you’ll see the Dropbox badge turn red with an exclamation mark icon. When you see this, you have the option to save your version of the file, and we’ll help the other person get your latest changes. If the other person saves their changes to the file before you save your changes, you’ll see the badge turn with a download arrow and you can update to their version. Note: When working in an Excel file, the badge may always display an exclamation mark (even if you or other viewers have not yet edited a spreadsheet). We suggest that you ignore the exclamation mark. When your collaborators make and save any actual changes, follow the steps to update to the latest version of the document. Choose to discard your own changes or save them in a separate version through the badge. If you and someone else are both in the same file and the other person saves their changes, the badge will turn into a download arrow, indicating that you don’t have the latest version of the file. You can update to the latest version from the badge. Click the Dropbox badge when it shows the download arrow. From the pop-out window, click Get [collaborator's name]'s version. To save your changes as a separate version, leave the Save my changes as a separate version checked. This will create a completely separate copy of the file with your changes and won't make any changes to the original file that your colleague already updated. To discard your unsaved changes, uncheck Save my changes as a separate version. Learn more about conflicted copies. 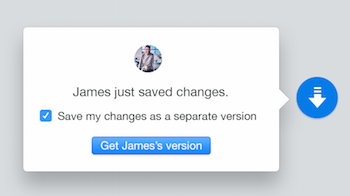 If you decided to check Save my changes as a separate version, both the shared version and your version will be open. You can tell which one is your version because it will show a grey Dropbox badge with an icon of two files. This version will contain all the changes you were making before your colleague saved his/her changes. You can delete this separate version if you no longer need it. 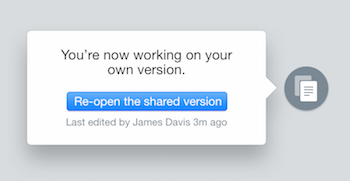 Through the grey badge, you’ll also have the option to open the latest, shared version.